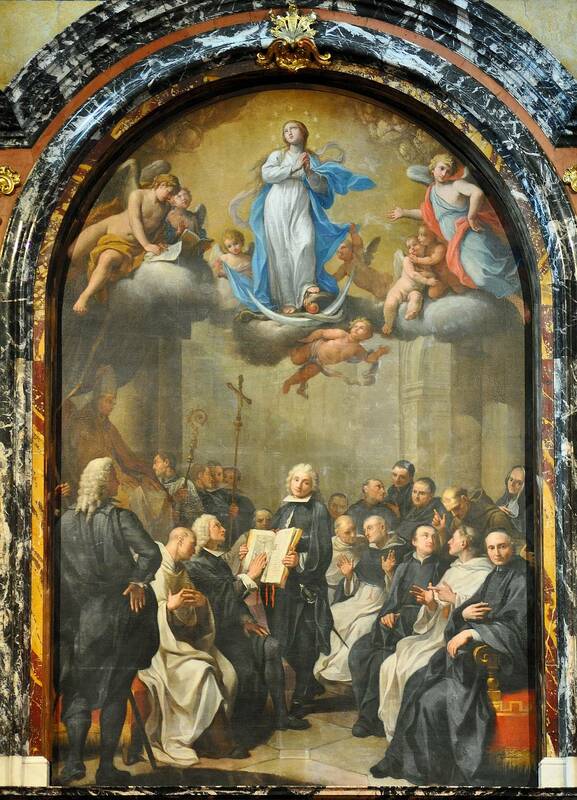 This painting is in the chapel of the University of Salamanca, Spain. In the 17th/18th Centuries, this university required all professors to swear their belief in the Blessed Virgin Mary's Immaculate Conception. Happy Feast of the Immaculate Conception everyone! This weekend’s prophecy features our most Blessed Mother Mary interceding for us all. On entering into the vision, I find myself carried away upon a summit, whence I contemplate a shining star which sets to guide my soul. I follow after it, and I see it is leading me towards a kind of temple radiating with heavenly beauty. [Source: First part of ecstasy of November 21, 1882, pp. 188-189, Prophecies of La Fraudais]. First of all, let us be patient. Once again, we are assured that Christ will come soon. And this prophecy was given to Marie-Julie in 1882, but in 2017 we are still waiting to see the Second Coming of Christ. But perhaps the coming of Christ that is being referred to in this prophecy is what has been called a time of visitation, meaning a time of Divine Chastisements. Over the years, Marie-Julie is told of these punishments in ever greater detail: the two world wars, as well as the birth of the See of the Cross, through the exile of Pope Gregory XVII and his Successor. At the beginning of this vision, Marie-Julie is carried to “a summit” which is a fitting dwelling place for the Blessed Virgin Mary, who is above every creature ever created. It is fitting that she who is the Immaculate Conception, and who has no sin, should dwell in the heights above men, on a spiritual summit. In this vision, our Blessed Mother is kneeling inside the temple where She was presented to God as a child. As our Good Mother, She is interceding for us to God the Father. But God the Father, with His Infinite Knowledge as our Creator, sees deeply into the great salvific reason behind our sufferings. This spiritual crucifixion of the Papacy and the Church will result in our final triumph over evil. Martyrdom produces Saints, and also, in the end, the conversions of many. And yes, in the end, there will be a “manifestation of the conquest of the guilty ones”, so there shall be Divine Justice also. But first, we are indeed to suffer at the hands of iniquitous men, so as to achieve our salvation, and also theirs. We must forgive our enemies and offer up our sufferings, at their hands, for their conversions! Currently, we do not know how many cardinals, bishops, priests, religious, and lay persons have been martyred in the exiling of Holy Mother Church by the masons and zionists, those erring men who are truly agents of evil still. One day we shall know that glorious number of martyrs, and we shall glory in their glory, gratefully acknowledging their prayers and intercession which have brought us the great graces of finding Holy Mother Church in Her exile, as well as obtaining the necessary conversion of our hearts so that we could see, understand, and accept the Truth. Let us unite our prayers with His Holiness, Pope Gregory XVIII, in asking our Blessed Mother, the long-suffering martyr, Pope Gregory XVII, and the other glorious Martyr-Saints, to intercede for the conversion of many more souls, so that they do not die outside of Holy Mother Church. May the French Monarch come, and may the Papal Restoration happen soon. Deo gratias!